I’d like to bring a little history into our daily theological walk today, and to reflect on the nature of what it means to do theology every day. On the one hand, this phrase, daily theology, seems repetitive on the outset: is not all theology a daily enterprise? Can you do theology and not think about it every day? On the other hand, the phrase is a call for reflection: what does is mean to think theologically every day? What if we were a bit more critical of those things we take for granted, and a bit more sacramental on those things that we deem useless? As we have tried from the beginning, part of doing theology every day is to engage in conversation, which has been a central goal of this blog from its beginning. Part of engaging in theological conversation is allowing voices of the past to speak meaningfully to the present: to engage within the communio sanctorum, the communion of Saints. In this vein, I’d like to initiate a series of posts entitled “Throwback Thursday,” or #tbt, that focus on historical aspects of our theological journey, and aim to let the voices of the past speak to the internet world of the present. On the first of our Throwback Thursdays, I wanted to share something very pertinent to this week that we began by arguing about celebrating the national holiday in honor of Martin Luther King, Jr.. In the memory of Rev. 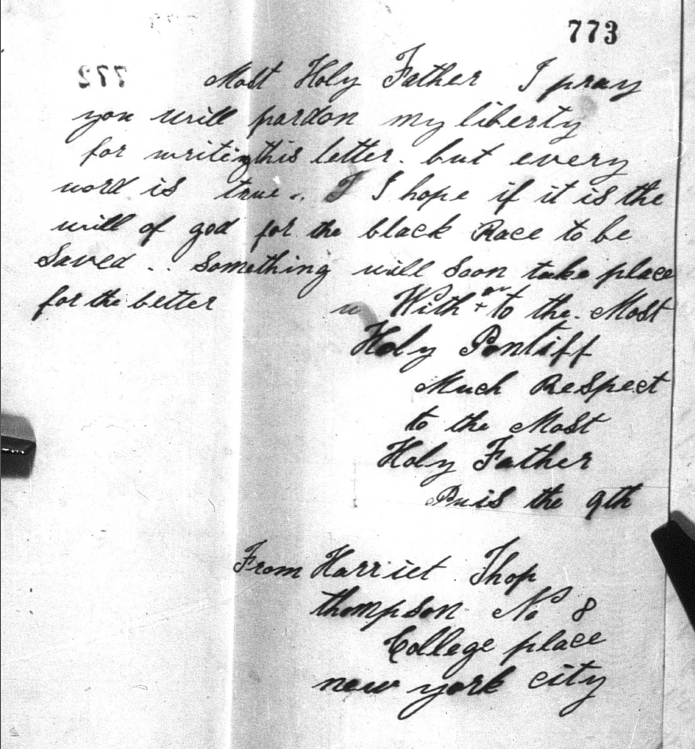 Dr. King, I’d like to present here–for the first time ever in publication–an original handwritten letter of Harriet Thompson, an African-American resident of New York City, which was sent to Pope Pius IX in 1853. 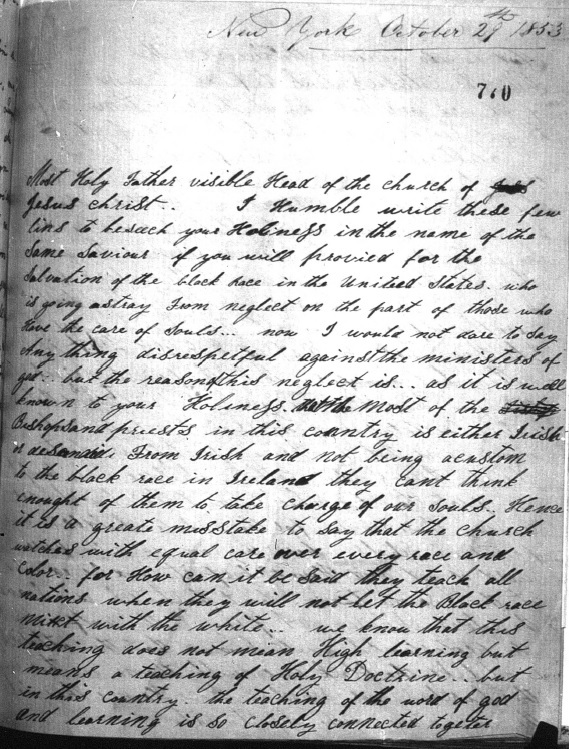 Having been received by the Vatican, the letter was forwarded to the Pope and marked to “comment upon.” And, sadly, while there is no record that such comments ever happened, the letter was stored deep in the archives of the Congregation for the Propagation of the Faith, where it still remains. Scholars from Notre Dame went to the Vatican some years back to attempt to catalog any American-related documents in said archive. They took pictures, cataloged to a decent degree of accuracy, and placed the images on microfilm. Oh yes, microfilm. 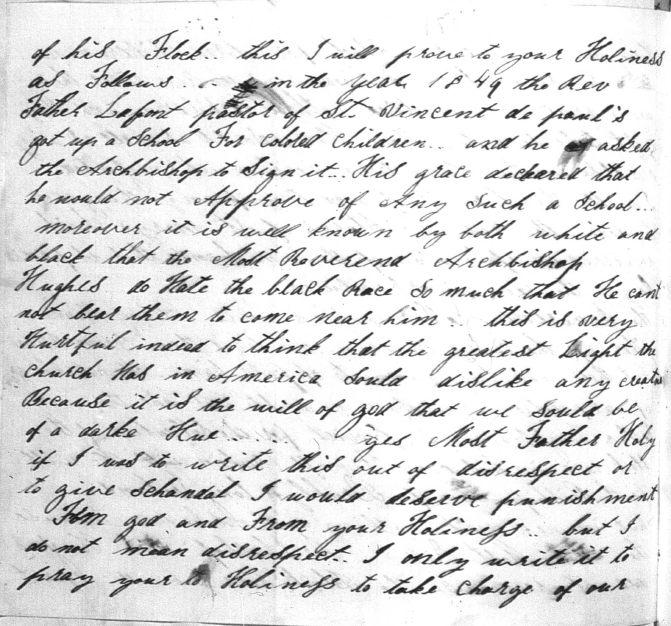 To this date, the images of Harriet Thompson’s letter I reproduce here are the only images of the microfilm on a computer, and the only copy of the letter outside of the archives of the Vatican. To note: while a majority of the letter was published in Cyprian Davis’ A History of Black Catholics in the United States (94-96), the letter has never before been published in its entirety, and the images have never been published. Furthermore, there is one rather compelling factual error that I wish to correct: both in Cyprian Davis’ reproduction of the text, and in subsequent references, people refer to the letter as having “twenty-six signers,” but as we will see in the letter itself, the signatures clearly refer to a previous petition brought to a local cleric. 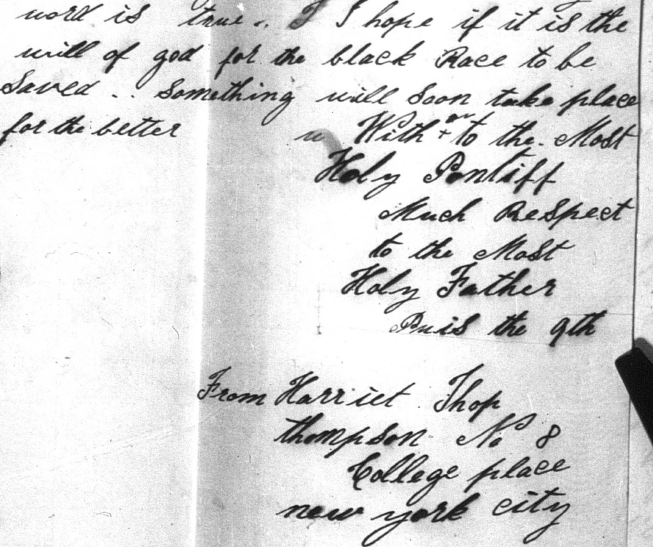 Harriet Thompson, alone, wrote the letter to the Pope. Harriet Thompson, alone, signed and sent the letter across the seas a century before Rev. Dr. King changed the world. Finally, before we get to the letter, some might ask a question of “why?” Why is this important?? The Roman response to which Davis refers would take place at the middle of the 20th century, but that is another story, and still a very, very incomplete one. Please note: All images below are used with full permission and copyright, 2014 by the University of Notre Dame Archives. 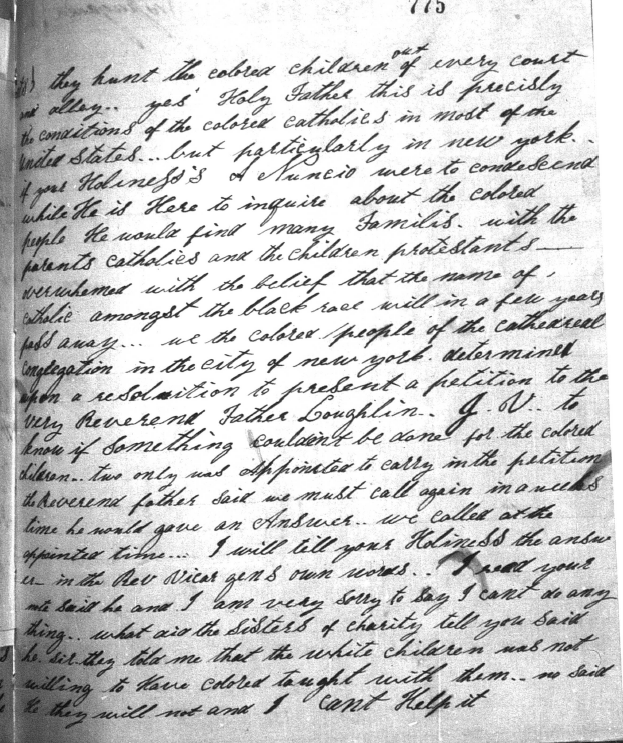 Harriet Thompson to Pope Pius IX, October 29, 1853, Congregatio de Propaganda Fide Microfilm, Reel 57, Scritture Riferite Nei Congressi, Vol. 16, Fols. 770-774, University of Notre Dame Archives. too…they hunt the colored children out of every court and alley. Yes Holy Father this is precisely the conditions of the colored catholics in most of the United States, but particularly in New York. If your Holiness’ Nuncio were to condescend while he is here to inquire about the colored people he would find many families with the parents catholics and the children protestants, overwhelmed with the believed that the name of Catholic amongst the black race will in a few years pass away. 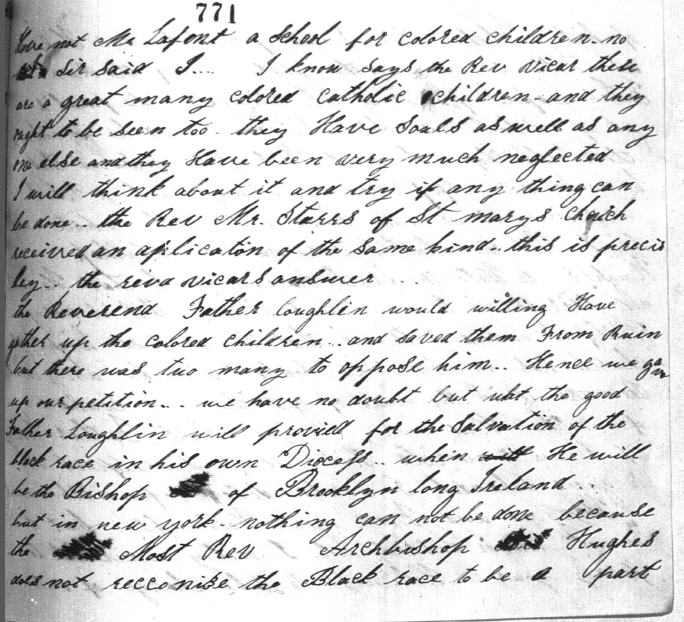 We the colored people of the Cathedral Congregation in the city of New York, determined upon a resolution to present a petition to the Very Revered Father Loughlin, J.V., to know if something couldn’t be done for the colored children. Two only was appointed to carry in the petition to reverend father said we must call again in a weeks time he would gave an answer. We called at the appointed time…I will tell your holiness the answer in the Rev. Vicar Gen.’s own words…I read your note, said he, and I am very sorry to say I can’t do anything. What aid the sisters of charity tell you, said he. 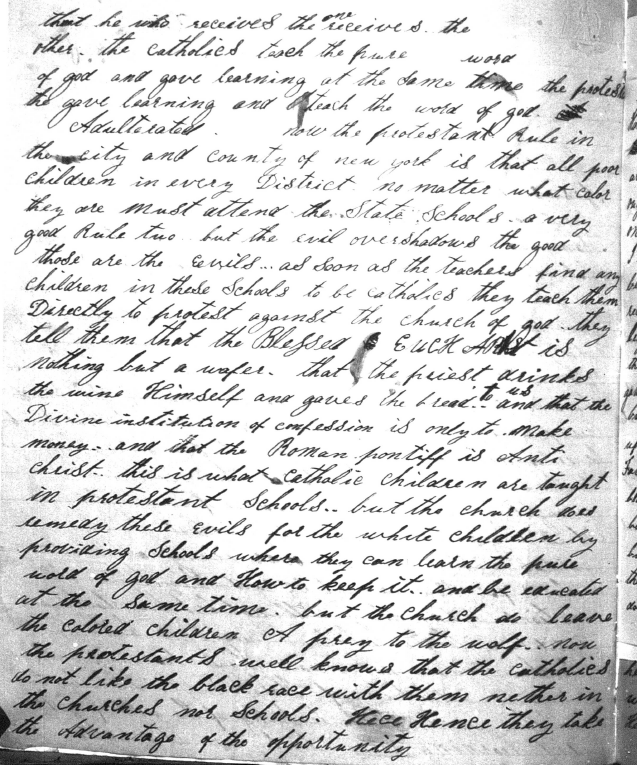 Sir, they told me that the white children was not willing to have colored taught with them, [said] me. Said he, they will not and I can’t help it. Have not Mr. Lafont a school for colored children? No sir, said I. I know, says the Rev Vicar, there are a great many colored Catholic children and they ought to be seen too. They have souls as well as anyone else and they have been very much neglected. I will think about it and try if anything can be done. The Rev. Mr. Starrs of St. Mary’s Church received an application of the same kind. This is precisely the Rev. Vicar’s answer…. souls in your Holy Authority. namely Reverend Father McFolgan and Anunder, Baltimore, and the Reverend Father Lafont, New York, and the Right Reverend Father Loughlin who will be consecrated tomorrow, is the only ones I ever knew to take notice of African race. 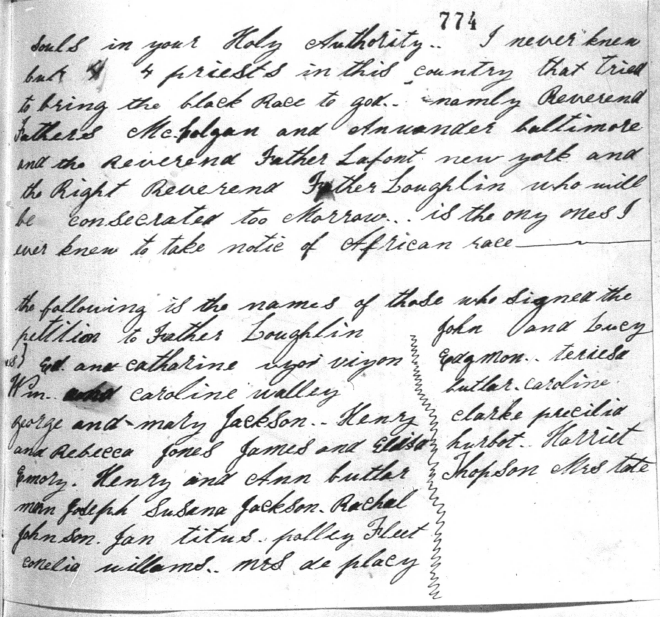 The following is the names of those who signed the petition to Father Loughlin: Ed and Catharine Uzoi Vizon, William and Caroline Walley, George and Mary Jackson, Henry and Rebecca Jones, James and Elisa Emory, Henry and Ann Butler, Joseph Susana Jackson, Rachel Johnson, Jan Titus, frolley Fleet, Cornelia Williams, Mrs. dePlacey, John and Lucy Edgmon, Terresa Butler, Caroline Clarke, Precilia Hurbot, Harriet Thopson, Mrs. Tate. Most Holy Father I pray you will pardon my liberty for writing this letter, but every word is true. I hope, if it is the will of God for the black race to be saved, something will soon take place for the better. 1. Note that the multiple names were for the petition, not for the overall letter, as I noted above. Note also that Harriet Thompson spells her own name wrong, as she almost does again at the end of the letter. One must wonder whether she dictated the letter to someone else, or whether she simply never wrote her full name very often. Either way, it speaks more to the tangibility of the letter than anything else. 2. After the letter, the records get blurry. 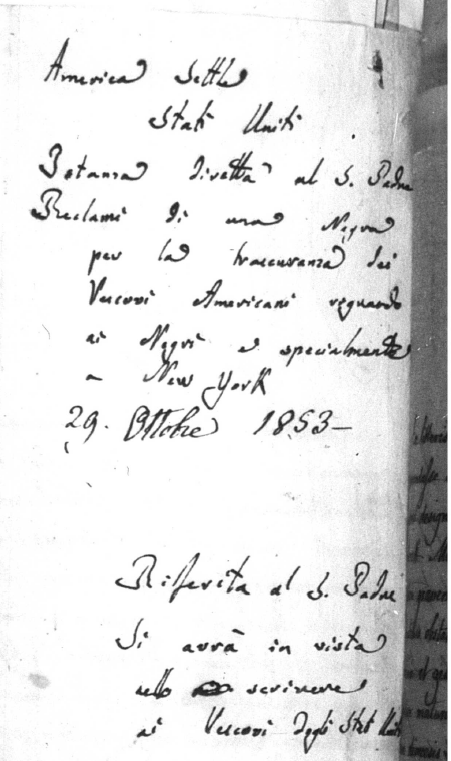 Below is a handwritten note, in Italian, that the letter was passed on to the Pope. The top half is a general summation of the letter, the bottom half says something like (please correct me if I’m wrong here): Referred to the Blessed Father. It will come into play in the visit with the Vicar General of the United States. 3. 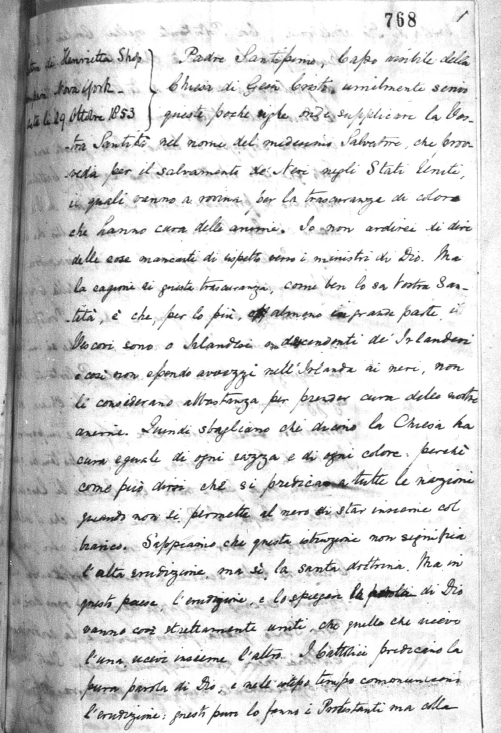 Finally, there’s a copy of the first page of an Italian translation of Thompson’s letter. The upper-left hand corner gives away what it is, without knowing any Italian. It’s interesting that the translator also didn’t know what to do with Thompson’s last name. Cyprian Davis, The History of Black Catholics in the United States. New York: Crossroad, 1990. Diana L. Hayes, Cyprian Davis, editors. Taking Down Our Harps: Black Catholics in the United States. Maryknoll, NY: Orbis, 1998. Peter Phan, Diana L. Hayes, editors. Many Faces, One Church: Cultural Diversity and the American Catholic Experience. Lanham, MD: Rowman and Littlefield, 2005. Jamie T. Phelps, O.P., editor. Black and Catholic: The Challenge and Gift of Black Folk. Milwaukee: Marquette University Press, 1997. There is a lot here. This is great for an undergrad course to think about. The letter says a lot about working for change and also in the “Catholic potential” for the church to be a source of social change. Sometimes, it takes people on the margins (prophets) to really see what the church can and should be doing in light of the Gospel.